Kitchen and Residential Design: Knock off or theft? Charles-Édouard Jeanneret-Gris, who was better known by the single name, Le Corbusier, was one of the great minds of the 20th Century. He was an artist, a writer, an architect, a designer and a philosopher. You can read about him here. Although a lot of his ideas about urban planning and architecture have been discarded and debunked, he remains a significant presence in the world of design. What I think was his contribution with the longest staying power and popularity is his Chaise Longue pictured here. This thing has been in continuous production since he debuted it in 1928. You can buy one today if you like, an officially licensed reproduction, through places like Design Within Reach or the MOMA online store. A real Chaise Longue will set you back somewhere around $3000. 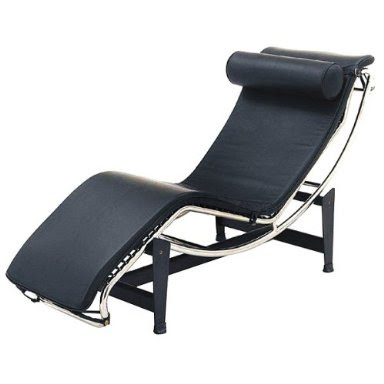 Not only can you buy a licensed reproduction, it is impossible to walk into a furniture showroom today without feeling the presence of Le Corbusier and his Chaise Longue. It's ideas and its lines are in every recliner, every "chaise lounge," and every scrap of pool furniture out there. Target, my dear Target has been engaged in a full court press to bring designed furniture to the masses for the last couple of years and I applaud their efforts. I love the idea of a good knock off, an homage to a great original. But there's a line between an homage and the theft of an idea and I think Target has crossed it. 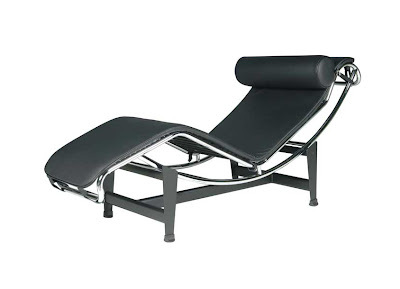 Shown below is an official Chaise Longue from Design Within Reach. Below is an image of Target's $500 version. It's a nearly exact replica and it looks to me like the theft of an idea. Maybe I'm more sensitive than most to intellectual property because I make a living from my ideas, and maybe I'm not. As I said before, I love a good knock off. And by that I mean something that's clearly influenced, yet still different from an original. This to me looks like bald-faced thievery. Am I being irrational? No, you're not being too sensitive, I don't think. Theft of intellectual property in this manner is a major problem in our industry. It *is* "bald-faced thievery" to reproduce someone else's design like that, especially down to the last little detail. That said, I do have to say that the very fact that so many ripoffs are happening means that far more people can afford good design than ever before. The flip side of that is that with pieces such as these, you can completely tell the difference between the original and the knockoff, usually within half a second or so of coming across one or the other. This is because the detailing and the finishes are *never* the same. If you look at the welds on the originals of Corbu's chairs, you will see absolutely nada. They are so smooth, there's no way you can see even the hint of a seam. On cheaper chairs, even if they do look just as good initially, you can always, always, always see that seam, just where you never wanted to have it. Thanks Wendy and I see your point about bringing good design to the masses. I think that's a great thing. Hoever, I think it needs to be done in a way that doesn't cheapen the originals or mislead people. If a manufacturer is going to base a piece on a classic, I think they need to attribute their work to the source.